WhatsApp today announced that users would be able to share their location live in the app. Your friends and family will be able to follow your movements for as long as you want. 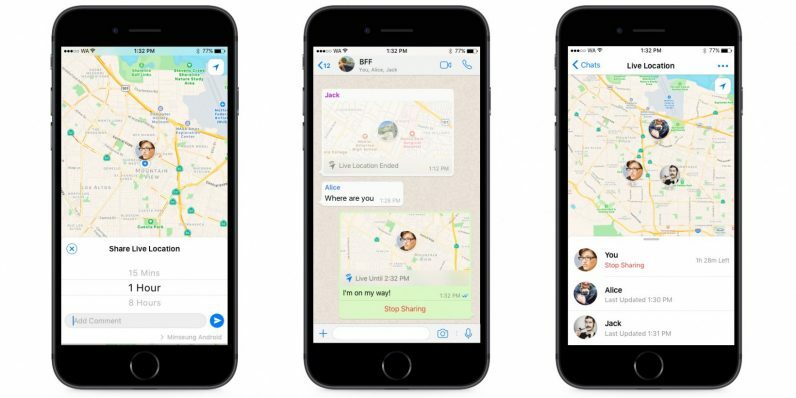 The feature is very similar to Facebook’s Live Location sharing, though you’ll be able to share your location for slightly longer in WhatsApp (at least 8 hours). To share your location, choose “Location” under the attachment options. After the app update, you’ll see a new option called “Share Live Location.” Then you select how long you want to share your location — 15 minutes, an hour, etc. Once you do, a map will appear in chat with your location on it, with your location being broadcast in real time. You can stop the feature any time. This sounds useful for guiding friends to a particular location: if they share their location with you, you can give them directions. You can also use it to make your flaky friends prove they’re actually “OMW.” It could also be used for safety purposes, such as in disaster situations. Also, if you’re in a chat where more than one person shares their location, you’ll all appear on the same map — meaning you could use this feature to coordinate meetups or trips. Live Location will be rolling out to Android and iOS users in the coming weeks.